. A number of you have asked for a tutorial for the GROCERIES sign I posted a couple days ago. I was a little hesitant because for the most part I NEVER REALLY KNOW WHAT I’M DOING! lol here. I look at how things are made and I try to replicate what I see or what I want. I try to find tutorials on the subject pick out the parts that are the easiest for me to do and try to use products that I already have on hand. Some of you asked if the wooden board was already old. I actually bought this with hubby last spring at the HD to attach lattice to on the bottom of our deck. We never used it and it’s been sitting in our garage since then. It is pressure treated wood so it has a bit of a green tint that doesn’t show well in the pics. For this project I used some acrylic paint in white and black, some verathane stain I had left over from my breakfast nook table, a sanding block, paint brushes, scissors, pencil, a bowl of water, and old saucer to mix my paints, and the lettering that I got form my word program. I started by painting my board with the white paint, I mixed the paint with water to give the board a color wash. You can add more color/water as you need. I just wanted the wood to look a little aged but you could certainly make it more opaque. You can see the difference here between the color wash and the original board. Once they are all cut out, I placed and spaced them evenly. I then took a pencil and traced each one out. I thought that this would be difficult considering the paper was so thin and flimsy but it was quite easy using both hands and it took me about ten minutes to trace them all out. After they are all traced out. I painted them. I mixed a little of the white and black together for a more charcoal color so it would look a little more aged as opposed to stark black. Here again you can you can use so many different colors, mixes etc. to get the look you want. After all the letters were dry, I used a little bit of my stain to add a little more aging, texture etc. I used an old cloth and just added it randomly, wiping most of it off. Once the stain is dry you can begin to sand and distress your board. This is the fun part as it really adds that aged look to your sign. ( I’d like to add that at this point if you feel you need to you can add more paint, stain etc. I added a little of my gray water left in the bowl from mixing to do a soft wash over some places that were unever and it just added to the rustic look of it). I’m hoping you will all try your hand at this as it’s a lot of fun and very rewarding. For some more inspiration I have a couple of signs that I seen this week and loved! Look at what Marian from MMS did this week! 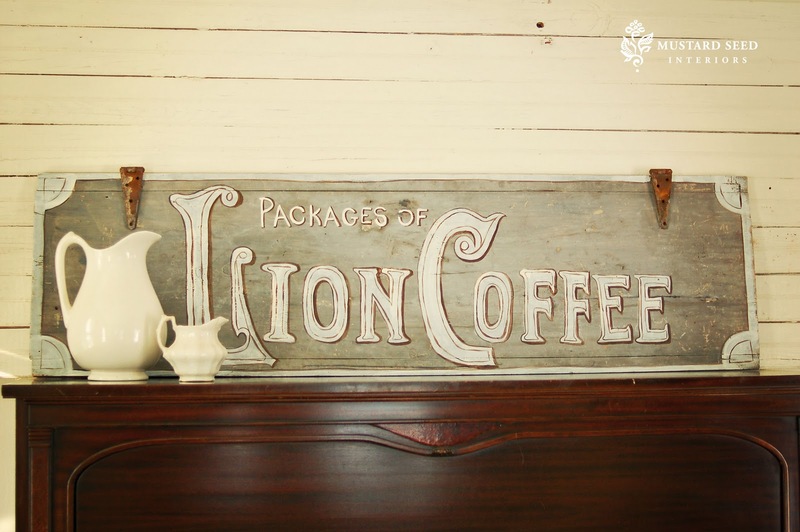 Loving this Lions coffee sign Look at the old hardware that she left on. This is what my lovely friend Robin from Happy at Home painted. Isn’t it great! We’ll have to ask Robin how she did it. I love it! Ali at My Third True Love is a new follower of mine and while visiting her blog I seen this. This is her first sign too! Jaime over at That’s My Letter has posted a great tutorial for this lovely sign as well. She traces over the letters as opposed to cutting them all out. Makes it much easier! Last but certainly not least is Lori from Frugal Farmhouse Design. Her sign was also inspiration for my GROCERIES sign. Lori does awesome work on very tight budgets! Hope this has helped to inspire you to start creating and restoring! Be blessed and thanks for visiting! I love the sign…I think it turned out great! Close to yours only I never cut out the letters, simply trace with a pen pressing hard enough to get an outline. Can't wait to see more! love the sign! i actually just made a grocery sign too… and plenty of others. inspired by miss mustard seed! i too trace the letters.. no way i'm cutting all that out! haha. love the groceries sign. beautiful. This looks great, I'm trying to think of a place to put a groceies sign, lol. Thanks for the inspiration! Thanks Jaime and Michael for that tip! That would certainly save time!lol will try it out next time. Thanks for the input! I love these, I'm going to have to try my hand at a neat little sign sometime! Thanks for sharing the tutorial! Great tutorial! You made it look so easy! I will bookmark this post because I'd love to try this. I can't believe I missed the sign that Marian made. They are all great! I have "sign" love! I just love your sign, Kim, and didn't have a clue how you did it, so thanks. I am going to look for some wood! Thanks for the tutorial … I definitely have to make one. You did a great job with the tutorial..love the sign and thanks for sharing your ideas! Great tips! I like your idea to mix the black and white paint to make it more faded or grey. I've always wondered how to get that look. You can bet all be trying it out on my next sign. Thanks for featuring my cow sign, that was very sweet of you. p.s. Have you hung your pretty sign yet! LOL no pressure or anthing, but it's got to be getting a little awkward carrying it around the house. Thanks so much for sharing how you made this great sign. I love the way it looks. Looks great. Thank you for sharing the tips. Hi just found you through linky party, havn't joined in yet just looking at how it all works but had to stop and read this post very inspirational so have become a follower. I'll admit I have some reluctance with paint. I don't know why! I'm just so messy with paint. I love what you've done though! Thanks for the tutorial. Gives me hope! Hey Kim, Nice Sign! I just posted about it and a few others…including one my mom made for us. 🙂 I hate to have to tell ya, but we can't get that glaze that Marian uses. Sigh. Ralph Lauren was replaced with Martha Stewart at all the HD's in Canada. I've looked everywhere…I even called RL. Nothing. Boo. All the more reason to get creative though, right?! I love it Kim! My pantry could use something like this. I'm posting it to my tumblr. I like, like, like your blog!!! So glad I found it. LOVE it! You are a talent! Whoa! This signage making idea is so cool! It has a touch of old school idea. I think it would also suit a coffee shop. Hi! Love signs, and these are great! I have painted several signs myself… freehand though. One tip is to sketch your design on paper or type it out first. The 3 main things to consider are colors, words/saying, and any images. I like an old, weathered look, so I sand everything down, in some places more than others, and spray with an acrylic sealant spray to finish.